To Cite: Kazempour V, Ebrahimi H, Asghari Jafarabadi M, Nourazar S G, Zamani H. The Effect of Group Cognitive Behavioral Therapy on Cognitive Emotion Regulation Strategies of Adolescents with Bipolar Disorder During Their Euthymic Phase: A Single-Blind Randomized Controlled Trial, Iran Red Crescent Med J. 2018 ; 20(S1):e61555. doi: 10.5812/ircmj.61555. Background and Objectives: Bipolar disorder (BD) is defined as emotion dysregulation. Since such dysregulation is also present during remission, it may be a risk factor for the development of further affective episodes. Therefore, the current study aimed at examining the impact of group cognitive behavioral therapy (GCBT), in comparison to treatment as usual (TAU), on the cognitive emotion regulation strategies of patients with BD. Patients and Methods: The current single-blind, randomized controlled trial (RCT) was performed from 2015 to 2017 in the psychiatric clinic of a referral hospital affiliated to Tabriz University of Medical Sciences, Tabriz, Iran. A total of 70 adolescents with early-onset BD were selected by the convenience sampling method based on the diagnostic and statistical manual of mental disorders-fourth edition-text revision (DSM-IV-TR) and allocated into receive either 12 sessions of GCBT (N = 35) or TAU (N = 35). Cognitive emotion regulation strategies were evaluated by cognitive emotion regulation questionnaire (CERQ) at baseline, after the intervention, and at 3-month follow-up. Efforts were made to follow up all randomized participants even if they withdrew from the assigned treatment prior to completion of GCBT sessions. Results: Compliance with treatment was moderate and the mean number of GCBT sessions that the participants attended was 6.97 (2.81). The two groups had significant differences in terms of post-test scores for other-blame (P = 0.001), rumination (P = 0.049), positive refocus (P = 0.008), positive reappraisal (P = 0.005), and putting into perspective (P = 0.001). In the 3-month follow-up, the two groups were significantly different only in other-blame (P = 0.001), positive reappraisal (P = 0.001), and putting into perspective subscales (P = 0.001). Therefore, the effects of the intervention were not effectively sustained after three months and there was room for improvement in terms of both outcome and compliance. Conclusions: The GCBT is more effective when the participants are involved in the study and get instructions on emotion regulation. However, since the effects of the intervention were not sustained for most of the subscales after three months, booster sessions might improve and prolong the impact of psychotherapies. Bipolar disorder (BD), also known as manic-depression, is a mental disorder characterized by unusual changes in mood, energy, activity levels, and behavior. The mood swings of bipolar disorder are so intense that can lead to severe disruptions in social, interpersonal, and occupational functioning (1). Early-onset BD includes the appearance of the first symptoms in childhood or adolescence and affects about 2% of this age group. Similar to all psychiatric disorders, early-onset BD has a worse prognosis and higher levels of comorbidity than BD emerging during adulthood (2, 3). These characteristics complicate the clinical manifestation of the disease in children and adolescents (4). The American Psychiatric Association defines BD as an emotion dysregulation (1). Gross defined emotion regulation (ER) as the processes controlling the appearance of emotions and how individuals experience and express these emotions (5). Cognitive ER is defined as the conscious, cognitive processes helping individuals manage the intake of emotionally arousing information and control their emotions during or following a stressful event (6). Due to impairments in ER, bipolar patients need more time to recover after stressful life experiences (7). Therefore, negative life events cause depression symptoms, and positive events stimulate signs of mania or hypomania in such patients (8). During each of the three phases of BD, patients present differences in the habitual use of particular ER strategies. Individuals in a hypomanic mood state are more likely to refocus on positive things, to positively reappraise, and to refocus on planning when confronted with an negative event (9) and use adaptive coping strategies even more frequently than healthy controls (10). Meanwhile, it is reported that increased levels of self-blame, catastrophizing, rumination, decreased use of positive reappraisal are significantly related to the development of depressive emotional problems (6, 11). Likewise, the euthymic state in BD is associated with an increased use of maladaptive ER strategies (i.e., rumination, catastrophizing, and self-blame) and a decreased use of adaptive ER strategies (planning, positive reappraisal, distracting, and putting into perspective). Due to the negative consequences of emotion dysregulation in BD, appropriate interventions are required to improve the performance of the patients. Cognitive behavioral therapy (CBT) is a psychosocial approach with impacts on clinical variables such as recurrence, the severity of symptoms (12), and the number of hospitalizations (13) for BD patients confirmed both in short- and long-term periods by a large body of empirical evidence. Since previous studies reported the presence of abnormal patterns of ER strategies during remission, such abnormality is not associated with the presence of acute affective symptoms and might serve as a risk factor to develop further affective episodes. Based on the positive effects of CBT on emotion regulation abilities of patients with depression (14) and anxiety (15), and according to the recommendations of previous studies (16), further research is required to assess whether patients with BD can be trained to effectively use adaptive ER strategies. Therefore, the current study aimed at evaluating the effects of GCBT as a cost-effective strategy on cognitive ER abilities. The current single-blind, randomized controlled trial (RCT) compared the effects of GCBT, and treatment as usual (TAU) in adolescents with BD during their euthymic phase. The study period lasted for six months and the outcomes were evaluated at baseline, three months after randomization (end-CBT; mid-TAU), and at the 3-month follow-up. Patients were recruited from Razi State Hospital affiliated to Tabriz University of Medical Sciences, Tabriz, which is the main referral center for psychiatric patients in East Azerbaijan Province, Iran. East Azerbaijan is a province in the Northwest of Iran and has an approximate population of 3.7 million. The study was conducted from September 2015 to March 2017. The eligible participants were all adolescents with a documented diagnosis of early-onset BD. The presence of the euthymic phase was confirmed by the Beck depression inventory (BDI-II) score < 12 or a young mania rating scale (YMRS) score < 14. The patients were eligible if they had the ability to participate in group therapy sessions and responded to written questions, did not have an affective episode during the past month or a history of hospitalization during the past 2 months, and had an intelligence quotient (IQ) over 90 according medical records. The patients were excluded if they had unstable medical treatments with dose variations during the study, had comorbidities that could affect the study outcomes, needed extra treatment, and had possible negative effects on other group members (such as conduct disorder or substance-related disorders). The current trial was based on the convenience sampling. Simple random allocation, using a table of random numbers, was performed after baseline evaluation of all participants. After the evaluation of previously hospitalized patients’ medical records, potentially eligible individuals were contacted by telephone and briefed about the trial. The patients were then examined in terms of the inclusion criteria and meetings at mutually convenient time and places were arranged with eligible individuals. During these meetings, the researcher responded to all questions of the patients and their caregivers and asked them to sign an informed consent form. The participants then completed the baseline questionnaires. The initial assessments and randomization were conducted by an independent researcher ‘not involved in the interventions. Finally, 70 adolescents (age: 12 - 18 years) with early-onset BD based on the Diagnostic and Statistical Manual of Mental Disorders-Fourth Edition-Text Revision (DSM-IV-TR) criteria of BD were randomly allocated to either the GCBT (N = 35) or TAU (N = 35) groups. GCBT was administered in closed groups. The participants received twelve 90-minute face-to-face sessions of group therapy. Since the sessions were provided once a week, the intervention lasted for three months. During the treatment phase, three groups were formed and the mean number of adolescents in each group was 12. GCBT was provided by a clinical psychologist with more than 10 years of clinical experience and advanced training in CBT. A psychiatric nurse also participated in the provision of the intervention. The focus of the intervention was on psychotherapy, but medications were also continued. Appropriate modifications were made in the GCBT protocol to match the needs of the adolescent participants. An age-appropriate manual was hence prepared based on a previously developed manual for adults. Treatment sessions consisted of psychoeducation (signs and symptoms, biopsychosocial model, course of disease, treatments, impact of BD on the individual and beloved ones, and initial interventions in mood cycles); indicating relationship between activities and mood (modification of activities to improve mood in depression and behavioral strategies to reduce mania/hypomania including simulation control, strategies to normalize sleep, relaxation strategies and contacting treatment team); describing interpretation and self-talk as the moderator between situation and emotion, using patient examples; Automatic and hot thoughts and their related emotions; describing relationships between positive thoughts and early signs of mania/hypomania; thought records: situation, mood, and thoughts; finding evidence for and against the hot thought and distortions; introduce evidence gathering and distortions for positive automatic thoughts in early signs of mania/hypomania; introduction of alternative thoughts for depression and mania/hypomania; review problems related to goals around adherence to medication regimen; examine connection between stressors and onset of episodes; introducing problem-solving strategies, etc. (17). Motivational interviews were also used to promote autonomous motivation for treatment. Parents also received several booklets containing information about early-onset BD and recommendations for family members. Each session comprised of four stages. First, group members discussed their weekend tasks (homework assigned in the previous session). New material was then presented during psychoeducation and therapy sessions. In the third stage, a variety of techniques, e.g., discussing the experiences of the patients, role-playing, and exposure were used to help the participants develop new skills. Finally, weekend homework was assigned. This process provided the patients with a chance to learn and practice new skills in a safe environment and gradually adopt them in their daily lives. After randomization, 35 patients were allocated in the control and TAU groups. The patients were asked not to use any other therapeutic approaches without informing the project leader. TAU services for patients with BD typically include regular visits by a psychiatrist for medication management if needed and brief psychological therapies and counseling by mental health clinicians. In both groups, assessments were performed at baseline before randomization, immediately after the 12-week course of the intervention, and 3-months after the end of the intervention. All efforts were made to minimize the missing data and follow up all participants. To avoid nonresponse bias, an intimate relationship was developed with the participants, so they were more likely to respond to the surveys. The rapid collection of data was avoided, and the evaluator investigated the surveys for the lost questions and asked the respondents to complete them and where it was not possible to collect face-to-face data, participants were offered the option of completing the questionnaires by phone. The observer was one, and the patients were assessed by an independent and trained clinician who was not involved in the treatments and remained blind to the grouping process. In order to ensure anonymity, unique identification numbers were assigned to all participants, and all outcome data and questionnaires were labeled by these codes. Consent forms and other documents, including the participant’s name, phone number, and address were kept confidential. The CERQ is a 36-item self-report questionnaire to measure the habitual use of 9 cognitive ER strategies (6), which determine a person’s method of coping with negative events. The questions are arranged in nine 4-item subscales, which are conceptually distinct. Studies on the Persian version of the questionnaire reported the internal consistency of its subscales ranging from 0.76 to 0.92 (18). In the current study, the age-adapted version of the CERQ was used and Cronbach’s alpha coefficients of 0.88 and 0.79 were obtained for the adaptive and maladaptive subscales, respectively. The YMRS is an interview-based scale administered to determine the respondents’ level of mania or hypomania (19). It was used at baseline to examine patients’ eligibility before randomization. The cutoff value was set to 12. The BDI-II is a 21-item self-report inventory widely used to evaluate depression (20). Each item measures the severity of a particular symptom through 4 statements. It was used at baseline to examine patients’ eligibility before randomization. The cutoff value was set to 14. A researcher-made questionnaire was used to collect the participants’ sociodemographic characteristics including age, gender, marital status, grade, family’s economic status, parents’ education, current family status, and family history of BD, age of onset, disease duration, number of hospitalizations, and number of suicide attempts. The main demographic characteristics were extracted from previous similar studies or included according to the suggestion of the co-authors who had the experience of working with bipolar adolescents. Based on an overall dropout rate of 30%, each group should contain 35 patients (70 in total), but made every effort to have the lowest possible dropout rate. The participants and therapists were aware of the allocated arm. However, the statistical analyzer was blinded to the allocation process. Moreover, the independent and trained rater who measured the outcomes was not involved in patient treatments and was blinded to study hypotheses and allocation. The statistical analyses were performed based on the intent-to-treat (ITT) approach. All data analyses were performed using the IBM SPSS Statistics for Windows, version 22.0 (IBM Corp., Armonk, N.Y., USA) with 95%IC. In order to report the results, mean (SD) values were used for quantitative variables and frequencies and percentages were used for qualitative variables (22). The Kolmogorov-Smirnov test was applied to check the normality of quantitative variables (23). Chi-square (24) and independent t-tests were conducted to compare qualitative and quantitative demographic and baseline variables. Within-group comparisons of the study variables were performed using repeated measures analysis of variance (ANOVA). Since the sphericity assumption was not met according to the Mauchly test for the scales, the Greenhouse-Geisser test was applied. To evaluate the effects of intervention and comparing the scores of post-tests, analysis of covariance (ANCOVA) was conducted with baseline values and potential co-founders as covariates (25). Non-parametric tests were used for data with non-normal distribution (26). The study protocol was approved by the Ethics Committee of Tabriz University of Medical Sciences. The trial was then registered in the Iranian Registry of Clinical Trials (registration number: IRCT201506286834N8). The participants and at least one of their parents were provided with details about the study objectives and procedures and asked to sign an informed consent form. The participants were ensured about the voluntary nature of participation and the confidentiality of data. A total of 644 medical records were assessed from 23 September 2015 to 22 September 2016. After face-to-face appointments with potentially eligible participants, 70 patients were selected and assigned to GCBT or TAU groups (N = 35 each). Primary and secondary outcome data were obtained 3 and 6 months after randomization, respectively. Despite reminder calls before each scheduled GCBT session, treatment compliance in the GBCT group was generally moderate and the mean number of sessions attended was 6.97 ± 2.81. 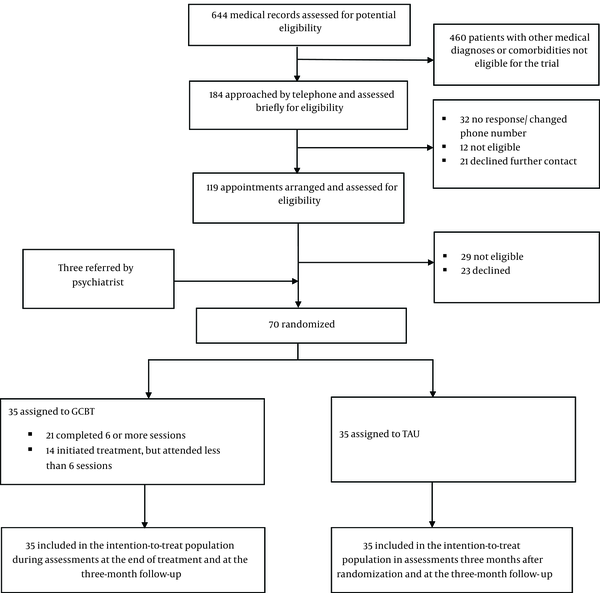 Figure 1 presents the flow diagram of patient recruitment in the GCBT and TAU groups. The 2 groups had no significant differences in terms of demographic characteristics and baseline cognitive ER features except rumination (P < 0.001), acceptance (P < 0.001), and putting into perspective (P = 0.007). These variables were later adjusted in ANCOVA (Table 1). aValues are expressed as mean (SD) or No. (%). Since the data had a normal distribution, within-group changes were assessed using repeated-measures ANOVA. The following plots present a summary of the mean pre- and post-intervention values, along with the results of the repeated measures ANOVA. No significant changes in any of the variables were observed in the TAU group. In the GCBT, however, the scores of 4 of the 9 subscales of the CERQ had significant changes over time. The changes were mostly among adaptive strategies, and only one was toward maladaptive ones (Figure 2). According to post-hoc tests, there were significant differences between baseline and post-intervention values (other-blame: P < 0.001; positive refocus: P = 0.010; and positive reappraisal: P = 0.003) and between baseline and 3-month follow-up values (other-blame: P < 0.001; positive refocus: P = 0.017; positive reappraisal: P < 0.001; putting into perspective: P < 0.001). An ANCOVA, adjusted for age, gender, and baseline values as covariates was applied to compare the GCBT and TAU groups in terms of the ER scales. The two groups had significant differences in post-test scores of other-blame, rumination, positive refocus, positive reappraisal, and putting into perspective. In 3-month follow-up, the two groups had absolute differences only in other-blame, positive reappraisal, and putting into perspective subscales (Table 2). Comparisons of other subscales revealed that despite the increase in the mean scores of adaptive strategies and the reduction in the scores of maladaptive strategies in the GCBT group, no statistically significant differences were observed between the two groups. To the best of authors’ knowledge, it was the first study to examine the effect of GCBT on cognitive ER strategies in adolescents with early-onset BD. The GCBT and TAU groups had significant differences in terms of other-blame, rumination, positive refocus, positive reappraisal, and putting into perspective. In 3-month follow-up, however, the difference between the two groups was only significant in other-blame, positive reappraisal, and putting into perspective subscales. 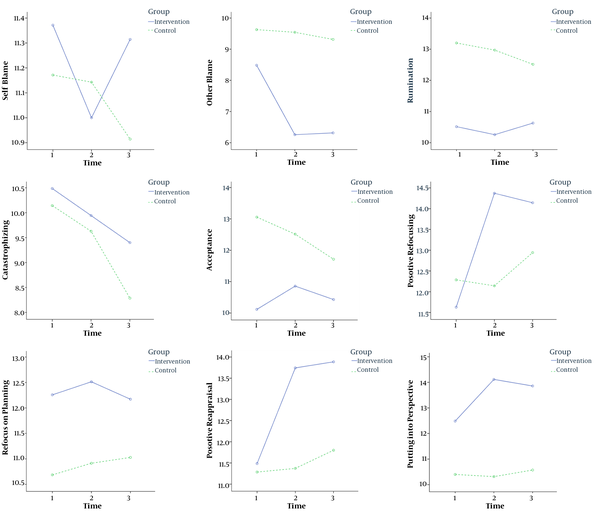 The two groups had no significant differences in other subscales despite the increase in the mean scores of adaptive strategies and the reduction in the scores of maladaptive strategies in the GCBT group. The findings of studies evaluating the effectiveness of CBT in individuals with BD are controversial. Although there are fewer studies on GCBT, there are several to date, which suggest GCBT as a viable treatment option with a significant effect on global and social functioning, relapse rates, and quality of life (27, 28). According to such positive effects, individuals with BD may benefit from CBT, which necessitates the use of ER strategies (29). Nevertheless, according to a meta-analysis by Lynch et al., while numerous studies reported the effectiveness of CBT in severe mental disorders such as BD, some well-conducted studies yielded negative results (30). In a systematic review of RCTs, it was found that the efficacy of some, but not all, psychological interventions to treat patients with BD in closely related conditions were promising, and the findings were more in favor of the reduction of relapse rate and hospital re-admission variables (31). In another meta-analysis of RCTs specifically focused on the effect of CBT on the treatment of bipolar patients, short-term efficacy of CBT was observed in reducing the rate of relapse of BD and in improving the severity of mania. But, these outcomes could be weakened over time. In addition, there was no proven efficacy of CBT on depression level of patients with BD (32). This conclusion was in line with the findings of the current study, which demonstrated that the maintenance of intervention on adaptive strategies was more persistent than maladaptive ones related to depression. Since there is little evidence about the psychosocial aspects of CBT approach (12), a comparison of the impact on the subscales of the emotion regulation strategies is difficult. However, the current study confirmed the gradual disappearance of outcomes. In a recently performed RCT in patients with depression, CBT was more effective in adaptive strategies such as cognitive reappraisal-related to the reduction in the severity of symptoms, while maladaptive strategies such as suppression of emotions had no change during the treatment (14). It appears that CBT is more effective and has more sustainable effects on adaptive strategies than maladaptive ones both in patients with BD and depression. Of course, further studies are needed in this regard. Although BD is characterized by amplified emotionality as well as greater efforts to regulate emotions, individuals with BD experience considerable emotional regulatory benefits by applying ER strategies in everyday life (33) and their capacity to regulate when instruction is largely intact (34). Likewise, the recent study indicated that the GCBT was more effective when the participants were involved in the study and received instructions on ER. However, the effects of the intervention were weakened in the follow-up period. Aleena C. Hay et al., were among the first to adopt a rigorous experimental approach to identify the potential mechanisms involved in the discrepancy between intact ER ability and impaired emotion regulatory achievement in patients with BD. They found successful cued ER strategy selection and evidence suggesting successful cued ER implementation (35). They thus concluded that patients with BD had a general cued ER ability, which could facilitate the treatment of the disorder (36). Of course these studies were conducted in a laboratory setting with limited choices for ER not comparable with the complex conditions of real life. Therefore, studies aiming at the clarification of the emotional abilities of individuals with BD need to adopt more ecologically valid settings by incorporating real life emotional experiences. Based on a previous research, there are two perspectives regarding ER in patients with BD. The first one, called the ability-deficit perspective, argued that patients with BD lack the ER abilities required for adaptive control of emotion reactivity. The second perspective, called the performance-deficit perspective backed up by the current study findings and those reported by Gruber et al., indicated that patients with BD and healthy individuals were not different in terms of the ER ability. The difference lies in the patients’ inability to perform successful regulation of their emotions on their own. As a result, individuals with BD may be able to regulate their emotions when cued. They may actually be able to use the regulatory cues to reduce emotion reactivity just as healthy individuals do. Nevertheless, in the absence of a cue, these patients may fail to perform successful ER strategies. They would thus show prolonged and amplified emotional responses when they are asked to spontaneously respond in the laboratory settings (37) or when navigating daily emotional life (33, 35). In conclusion, it was previously shown that the abnormal patterns of ER strategies were present even in euthymic phase of bipolar disorder; however, the role of clinical interventions to improve the performance of the patients was not characterized. The current study demonstrated the significant short-time benefits of GCBT, but to yield sustainable effects, booster sessions might be useful here, so further research is needed to examine the effects of adding booster sessions on the sustainability of the results. The current study had several strengths that include a robust methodology, application of a randomized study design with a control group and pre and post-treatment evaluation points and 3-month follow-up; standardized diagnostic and evaluation tools that include self-assessment scales and interview-based scales; the blind statistician and the independent and blind evaluator to collect data and use the same two psychotherapists to perform interventions to all groups; and designing the protocol based on the CONSORT statement, under the supervision of ethics committee. The current study had a number of limitations that should be considered when interpreting the results. First, the results may not be generalizable, since all participants were recruited from a single research center. Further multicenter trials are hence required. Moreover, since comorbidities are common in younger patients with BD, the exclusion of some comorbidities might have restricted the scope of the results. It is of course unethical to bring heterogeneous groups of teenagers with such comorbidities together. Furthermore, the short follow-up period of the study (i.e., three months) might have prevented the precise evaluation of the long-term effects of the intervention. Therefore, the observed effects might gradually disappear over time. Dissimilar to other trials in this field, the current study did not include booster classes. Another limitation was performing outcome assessment based on self-report scales. Finally, the study did not measure compliance to treatment and therapists’ competence. These factors should also be evaluated in future studies. The authors are grateful to the participants and their parents. They also thank the adolescent welfare institutes for their participation in the project. Funding/Support: The current study was funded by vice-chancellor (research) of Tabriz University of Medical Sciences. 1. American Psychiatric Association. Diagnostic and statistical manual of mental disorders (DSM-5®). American Psychiatric Pub; 2013. doi: 10.1176/appi.books.9780890425596. 2. Carlson GA, Findling RL, Post RM, Birmaher B, Blumberg HP, Correll C, et al. AACAP 2006 Research Forum--Advancing research in early-onset bipolar disorder: barriers and suggestions. J Child Adolesc Psychopharmacol. 2009;19(1):3-12. doi: 10.1089/cap.2008.100. [PubMed: 19232018]. 3. Lazaro L, Castro-Fornieles J, de la Fuente JE, Baeza I, Morer A, Pamias M. Differences between prepubertal- versus adolescent- onset bipolar disorder in a Spanish clinical sample. Eur Child Adolesc Psychiatry. 2007;16(8):510-6. doi: 10.1007/s00787-007-0629-9. [PubMed: 17846818]. 4. Sadock BJ, Sadock VA. Kaplan and Sadock's pocket handbook of clinical psychiatry. Lippincott Williams & Wilkins; 2010. 5. Gross JJ. Emotion Regulation: Current Status and Future Prospects. Psychol Inq. 2015;26(1):1-26. doi: 10.1080/1047840x.2014.940781. 6. Garnefski N, Kraaij V. The Cognitive Emotion Regulation Questionnaire. Eur J Psychol Assess. 2007;23(3):141-9. doi: 10.1027/1015-5759.23.3.141. 7. Goplerud E, Depue RA. Behavioral response to naturally occurring stress in cyclothymia and dysthymia. J Abnorm Psychol. 1985;94(2):128-39. [PubMed: 3998281]. 8. Johnson SL. Life events in bipolar disorder: towards more specific models. Clin Psychol Rev. 2005;25(8):1008-27. doi: 10.1016/j.cpr.2005.06.004. [PubMed: 16129530]. 9. Gruber J. Can Feeling Too Good Be Bad? Positive emotion persistence (PEP) in bipolar disorder. Curr Dir Psychol Sci. 2011;20(4):217-21. doi: 10.1177/0963721411414632. 10. Thomas J, Knowles R, Tai S, Bentall RP. Response styles to depressed mood in bipolar affective disorder. J Affect Disord. 2007;100(1-3):249-52. doi: 10.1016/j.jad.2006.10.017. [PubMed: 17134763]. 11. Garnefski N, Kraaij V. Cognitive Coping and Psychological Adjustment in Different Types of Stressful Life Events. Indiv Differences Res. 2009;7(3). 12. Reinares M, Sanchez-Moreno J, Fountoulakis KN. Psychosocial interventions in bipolar disorder: what, for whom, and when. J Affect Disord. 2014;156:46-55. doi: 10.1016/j.jad.2013.12.017. [PubMed: 24439829]. 13. Vieta E, Colom F. Psychological interventions in bipolar disorder: From wishful thinking to an evidence-based approach. Acta Psychiatr Scand Suppl. 2004;(422):34-8. doi: 10.1111/j.1600-0447.2004.00411.x. [PubMed: 15330936]. 14. Forkmann T, Scherer A, Pawelzik M, Mainz V, Drueke B, Boecker M, et al. Does cognitive behavior therapy alter emotion regulation in inpatients with a depressive disorder? Psychol Res Behav Manag. 2014;7:147-53. doi: 10.2147/PRBM.S59421. [PubMed: 24872725]. 15. Suveg C, Sood E, Comer JS, Kendall PC. Changes in emotion regulation following cognitive-behavioral therapy for anxious youth. J Clin Child Adolesc Psychol. 2009;38(3):390-401. doi: 10.1080/15374410902851721. [PubMed: 19437299]. 16. Wolkenstein L, Zwick JC, Hautzinger M, Joormann J. Cognitive emotion regulation in euthymic bipolar disorder. J Affect Disord. 2014;160:92-7. doi: 10.1016/j.jad.2013.12.022. [PubMed: 24445131]. 17. Bieling PJ, McCabe RE, Antony MM. Cognitive-Behavioral Therapy in Groups. Guilford Press; 2009. 18. Hasani J. The psychometric properties of the cognitive emotion regulation questionnaire (CERQ). J Clin Psychol. 2010;2(3):73-84. 19. Barekatain M, Tavakoli M, Molavi H, Maroufi M, Salehi M. Psychometric properties of a Persian-language version of the Young Mania Rating Scale: YMRS. J Psychol. 2007;11(2):150-67. 20. Beck AT, Steer RA, Brown GK. Beck depression inventory-II. San Antonio. 1996;78(2):490-8. 21. Ghasemzade Nassaji S, Peyvastegar M, Hosseinian S, Mutabi F, Banihashemi S. Effectiveness of cognitive- behavioral intervention on coping responses and cognitive emotion regulation strategies in women. J Behav Sci. 2010;4(1):35-43. 22. Asghari Jafarabadi M, Mohammadi SM. Statistical series: summarizing and displaying data. J Diabetes Lipid Disord. 2013;12(2):83-100. Persian. 23. Asghari Jafarabadi M, Mohammadi SM. Statistical series: introduction to statistical inference (Point estimation, confidence interval and hypothesis testing). J Diabetes Lipid Disord. 2013;12(3):173-92. Persian. 24. Asghari Jafarabadi M, Soltani A, Mohammadi M. Statistical series: The analysis of contingency tables 1 (chisquare tests). Iran J Diabetes Metab. 2014;13(2):83-101. Persian. 25. Asghari Jafarabadi M, Soltani A, Mohammadi SM. Statistical series: tests for comparing of means. Iran J Diabetes Lipid Disord. 2013;12:265-91. Persian. 26. Asghari Jafarabadi M, Soltani A, Mohammadi SM. Statistical Series: Common Nonparametric Methods. Iran J Diabetes Lipid Disord. Persian. 27. Patelis-Siotis I, Young LT, Robb JC, Marriott M, Bieling PJ, Cox LC, et al. Group cognitive behavioral therapy for bipolar disorder: a feasibility and effectiveness study. J Affect Disord. 2001;65(2):145-53. [PubMed: 11356238]. 28. Castle D, Berk M, Berk L, Lauder S, Chamberlain J, Gilbert M. Pilot of group intervention for bipolar disorder. Int J Psychiatry Clin Pract. 2007;11(4):279-84. doi: 10.1080/13651500701246088. [PubMed: 24940727]. 29. Hollon SD, Ponniah K. A review of empirically supported psychological therapies for mood disorders in adults. Depress Anxiety. 2010;27(10):891-932. doi: 10.1002/da.20741. [PubMed: 20830696]. 30. Lynch D, Laws KR, McKenna PJ. Cognitive behavioural therapy for major psychiatric disorder: does it really work? A meta-analytical review of well-controlled trials. Psychol Med. 2010;40(1):9-24. doi: 10.1017/S003329170900590X. [PubMed: 19476688]. 31. Oud M, Mayo-Wilson E, Braidwood R, Schulte P, Jones SH, Morriss R, et al. Psychological interventions for adults with bipolar disorder: systematic review and meta-analysis. Br J Psychiatry. 2016;208(3):213-22. doi: 10.1192/bjp.bp.114.157123. [PubMed: 26932483]. 32. Ye BY, Jiang ZY, Li X, Cao B, Cao LP, Lin Y, et al. Effectiveness of cognitive behavioral therapy in treating bipolar disorder: An updated meta-analysis with randomized controlled trials. Psychiatry Clin Neurosci. 2016;70(8):351-61. doi: 10.1111/pcn.12399. [PubMed: 27177717]. 33. Gruber J, Kogan A, Mennin D, Murray G. Real-world emotion? An experience-sampling approach to emotion experience and regulation in bipolar I disorder. J Abnorm Psychol. 2013;122(4):971-83. doi: 10.1037/a0034425. [PubMed: 24364600]. 34. Gruber J, Harvey AG, Johnson SL. Reflective and ruminative processing of positive emotional memories in bipolar disorder and healthy controls. Behav Res Ther. 2009;47(8):697-704. doi: 10.1016/j.brat.2009.05.005. [PubMed: 19501814]. 35. Gruber J, Hay AC, Gross JJ. Rethinking emotion: cognitive reappraisal is an effective positive and negative emotion regulation strategy in bipolar disorder. Emotion. 2014;14(2):388-96. doi: 10.1037/a0035249. [PubMed: 24364852]. 36. Hay AC, Sheppes G, Gross JJ, Gruber J. Choosing how to feel: emotion regulation choice in bipolar disorder. Emotion. 2015;15(2):139-45. doi: 10.1037/emo0000024. [PubMed: 25313669]. 37. Gruber J, Eidelman P, Johnson SL, Smith B, Harvey AG. Hooked on a feeling: rumination about positive and negative emotion in inter-episode bipolar disorder. J Abnorm Psychol. 2011;120(4):956-61. doi: 10.1037/a0023667. [PubMed: 21553935].